New mediawiki-bugzilla features | LegNeato! I’ve been looking for high leverage ways to contribute to Mozilla now that my spare time is virtually non-existent. 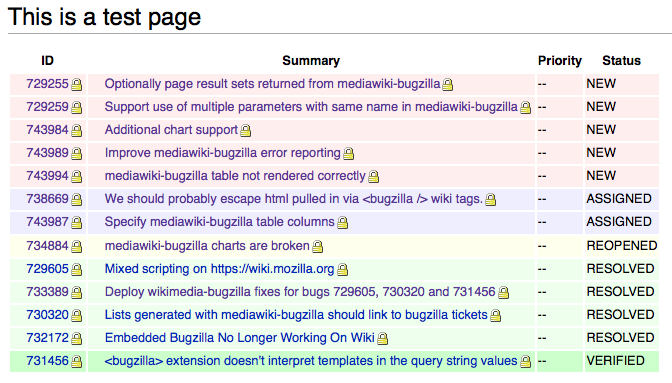 Luckily, mediawiki-bugzilla is gaining a lot of traction at Mozilla and looks to be really helping out. Seeing as I started the project I decided to add some much needed features! These aren’t rolled out on wiki.mozilla.org yet but they will be soon (I have a couple of little things to finish first). Code can be found in my github repo (yes, I am currently working to rectify the mozilla/personal dual repo situation). First up, a minor yet helpful addition. When showing bug data in a table, the rows are now colored by their status. Spiffy. Once people started using the extension the first question was “can I choose which fields to show and hide?” With this change you specify fields in the “include_fields” setting of BZ REST API options as you normally would. Mediawiki-bugzilla will then a) only fetch those fields and b) display those columns. Not all fields have custom templates yet. This means some fields (such as assigned_to) won’t show up properly. I’m going to be writing a bunch but feel free to submit a patch! Large lists of bugs on a wiki page can get a bit unwieldy. It was requested to be able to sort by columns, search through the results, and paginate to keep vertical space to a minimum. I beefed up the support for client side jquery/Datatable rendering. You can currently make bar graphs by setting type=”count”, display=”bar”, and including Bugzilla REST API /count parameters. I actually had support for other chart types stubbed out and decided to implement pie charts. We can make tables, we can make bar charts, and we can make pie charts…why not a simple list? 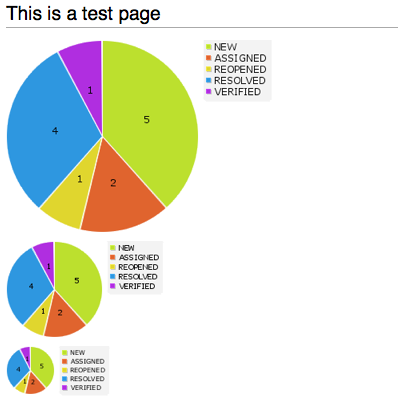 While I was adding support for pie charts I added a simple unordered list display. The field/column support I talked about above works here too! It’s not perfect, but I’ve put in a little more support for detecting errors. If the JSON is invalid or your “display” and “type” combination are invalid you will get a message saying so. It’s great to see these new mediawiki-bugzilla features and I think this is going to be a really useful tool for people. For the new Webdev get involved page it was really easy to get a page set up with this and we can give much more valuable information to new contributors than the previous Webdev get involved page did. This is awesome! This covers all most all the features I wanted, thanks so much.